One of the most beautiful and powerful thirteenth century paintings in the Uffizi in Florence is the Rucellai Madonna by Duccio. It was commissioned in 1285 by a body called the Confraterniti of the Laudesi of the Church of Santa Maria Novella. In Tuscany and Umbria in the thirteenth century there grew up many groups of what were usually called compagnie delle laude (�lauda companies�). Their activities extended well beyond the commissioning of paintings. The compagnie delle laude were groups of laymen - and sometimes laywomen - generally organised by the Domenican and Franciscan friars, which met to do works of charity, to listen to religious instruction and to take part in religious ceremonies in which they sang laude (plural of lauda). Laude were often sung in the evening in front of a statue of the Virgin Mary. Their texts were, most often, in Italian - since their singers would not generally have known Latin - and are amongst the earliest poetic texts in Italian. Their music was indebted to popular traditions. Blake Wilson�s book of 1992, Music and Merchants: The Laudesi Companies of Republican Florence, while it deals mainly with a later period than the present CD, is full of useful information. We have some two hundred manuscripts containing the verbal texts of laude. Most of the texts are anonymous, though there are some by the important poet Jacapone da Todi.� From the earlier period, the time of the initial growth of the form, there survive only two manuscripts which contain both verbal texts and musical melodies of laude � Codice Banco Rari 18, now in the Biblioteca Nazionale Centrale in Florence and Codice 91, belonging to the Biblioteca Comunale / Accademia Etrusca in Cortona. The Florentine codex contains 89 laude with melodies; the Cortona codex contains 46 laude with melodies. Some 20 texts and 10 melodies appear in both manuscripts. The Florentine manuscript is the later of the two and is rather more elaborate, perhaps reflecting professional performance practice. This fascinating CD contains performances of a selection of material from Codice 91. A major problem is that the musical texts contain no mensural indications insofar as rhythm is concerned. Nor, of course, do they contain any guidance as to instrumentation. There are competing theories as to what rhythmical practice should be adopted. Account books of some of the compagnie delle laude survive and record payments to musicians, to players of the viol, harp etc. ; such documents, along with the evidence of contemporary paintings, make possible informed guesses as to the kind of instrumentation which might be appropriate. Here the instrumental accompaniment is provided � in various permutations � by viol, harp, lute, recorder, cialamello (a shawm-like ancestor of the oboe), tambourin de B�arn (a kind of string drum, often called a tambourin � cordes) and miscellaneous percussion. The vocal group, La Dolce Vista � their name taken, presumably, from the ballata by Landini -� is dominated by female voices. The results are often very beautiful, the rhythmic propulsion clear without excessive emphasis, the interplay of voices and instruments well judged. All the soloists sing attractively, though Dario Polini�s tenor isn�t always quite as commanding as it might be. The ensemble singing is generally very good and convincingly idiomatic. There is perhaps just a bit too much polish and grace to the performances. Much of this music must have been performed without scores and, indeed, by people who couldn�t read music. Furthermore, the compagnie delle laude have been seen as one of the products of what has been called the religious hysteria of mid-thirteenth century Italy. Their ceremonies sometimes included self-flagellation. Heaven forbid that we should expect modern performers to undertake such practices in the interests of �authenticity�! But perhaps we might expect just a little more abandon, a little less precise calculation, a little less politeness, in the performance of laude such as these. 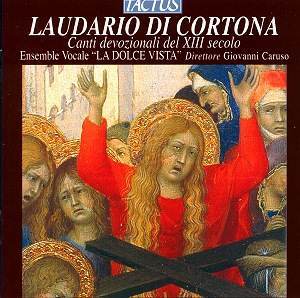 There have been other recordings of some of the laude; I think, however, that this is the first to be exclusively devoted to materials from the Cortona MS. The booklet contains a useful essay � in Italian, English and French � by Giorgio Monari and the Italian texts (but no translations). Despite my minor grumble about what I take to be the over-decorous nature of these performances, this is a lovely recording of some fascinating music. It makes a persuasive case for the performance strategies that have been adopted � without doing anything to rule out quite other approaches to the music. Warmly recommended.